“I can’t wait to go home after work and fold all that laundry that’s been sitting in a pile on my bed!” said no one, ever. For those of you who put off folding your laundry until they need to be washed again, Laundroid is your dream come true. The world’s first laundry folding robot turned heads at this year’s Consumer Electronics Show in Las Vegas, where it was introduced as a collaboration between Seven Dreamers Laboratories Inc., Daiwa House Industry Co. and Panasonic Corp.
Laundroid works through image sensors, which are used to detect the type of clothing to be folded after the freshly-laundered pieces have been placed in a bottom pull-out bin. 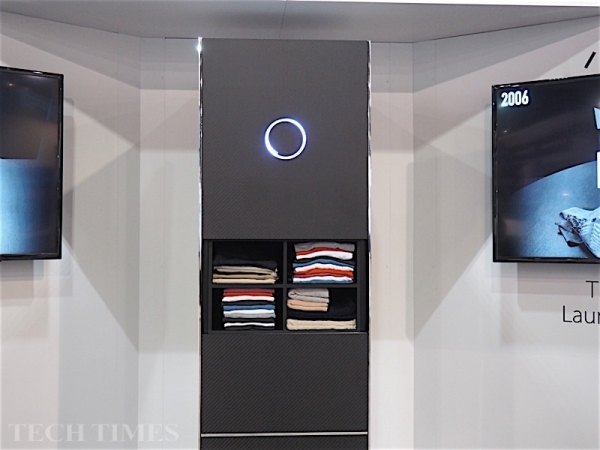 After Laundroid determines whether the article of clothing is a t-shirt, collared shirt, skirt, shorts, or pants, the clothes are folded neatly and moved up to the shelving area. According to the manufacturers, Laundroid can hold up to 4.5 kg of clothes, and each article of clothing takes between 3-5 minutes to fold. That seems like a lot of time, but think about it: you could dump your laundry in the machine, go run an errand or two, and by the time you come back all your laundry will be neatly folded. The current model of Laundroid will be available for sale this year, but by 2018 the manufacturers hope to have integrated the machine into Panasonic washers and dryers to create your dream laundry machine. This entry was posted in Trends In Medical Apparel and tagged Technology, Trends on March 9, 2016 by Ariel Jacoby.